What I'm Watching: "Reason and Emotion"
"Emotion" steers in the direction of an attractive woman. 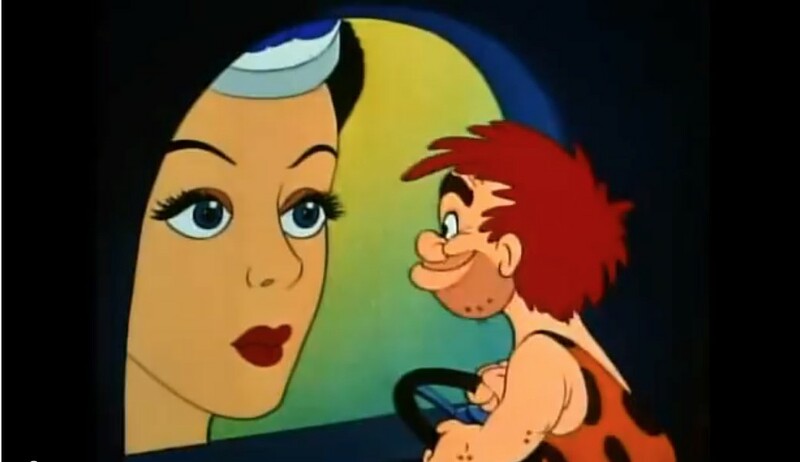 The 1943 Disney cartoon “Reason and Emotion” reestablished itself in popular consciousness this year, when various media outlets noted that its premise was revived by Pixar’s summer release, Inside Out. When I saw Inside Out (at the glorious Sunset Drive-In in Colchester), “Reason and Emotion” was the first thing that came to my mind, too. The connections between the two films are strong and obvious. The conceit of both movies is the personification of human feelings and thoughts with little characters who live in our heads and govern our actions. In “Reason and Emotion,” a little caveman-like guy represents Emotion: the rash, spur-of-the-moment processes that cause us to act without thinking. Reason is represented by a sensible, egghead-type fellow who thinks before he acts. The battle between our instincts and our rationality is dramatized in the film when, for instance, a man passes an attractive woman on the street, and the homunculi inside his head literally do battle. Emotion clobbers Reason over the head with a cudgel to direct the man to make a pass at the woman, who promptly slaps the man in the face. That slap occasions a glimpse inside the head of the woman, whose life is governed by similar homunculi. In her case, Emotion is a sassy broad who craves fattening foods, and Reason is a schoolmarm who advocates taking care of one’s figure. This element of the film dates pretty badly — yet it has a modern parallel in Inside Out, as I discuss below. Another plain connection between the two films is that both were produced by Disney (the entity that owns Pixar), a company that produced, and still produces, film’s most astute and sophisticated animation. “Reason and Emotion” is animated “on ones,” meaning that its animators made one drawing for every single frame of film. (Since 35mm film ran at 24 frames per second, that means that, for this film of approximately eight minutes, Disney animators created about 11,500 drawings, a staggering sum.) More drawings means an increased ability to create fluid, detailed animation. Pixar’s digital animation is, famously, equally detailed and skillful. Yet perhaps an even more pertinent factor in Inside Out’s greater overall subtlety is that “Reason and Emotion" is a straight-up, broad-strokes, Hitler-baiting propaganda film. Released smack in the middle of World War II, “Reason and Emotion” was one prong of Disney’s comprehensive cinematic contributions to the American war effort. Most Hollywood studios lent themselves to that effort in some way: by financing and loaning talent to films produced by the War Department, by inserting unmistakable propaganda messages into their features, etcetera. Disney, though, went above and beyond. The studio (which was not yet really a studio, in that, in 1943, Disney films were still distributed by RKO) produced more than entertaining bits of propaganda like “Reason and Emotion” and the better-known “Der Fuehrer’s Face.” It also made drier propaganda titles such as “Cleanliness Brings Health,” “The Grain That Built a Hemisphere” and even the feature-length Victory Through Air Power. Drier still were the handful of animated instructional films that Disney produced for the purpose of educating laborers who were adjusting to new wartime jobs. The key title of this type was “Four Methods of Flush Riveting,” a film whose title compels me to tell you that it is, in fact, nothing less than a riveting piece of cinema. C’mon, that pun is irresistible. I’m sure the Disney animators themselves used it repeatedly when they were laboring at their drawing tables. So far as I know, the stellar (and now quite rare and valuable) DVD set called “Walt Disney Treasures: On the Front Lines” collects the entirety of Disney’s wartime efforts. For this reason, it’s a valuable historical document. It’s a needle scratcher of a moment, stunning in its bluntness. The film goes on to explain how Hitler preys on the emotions of fear, sympathy, pride and hate in his nefarious attempt to win the war and dominate the world. The only way we’re going to win this war, the voiceover states, is to resist these foolish, overemotional entreaties and marshal our own senses of reason and emotion to combat the German Menace with intelligence and passion. 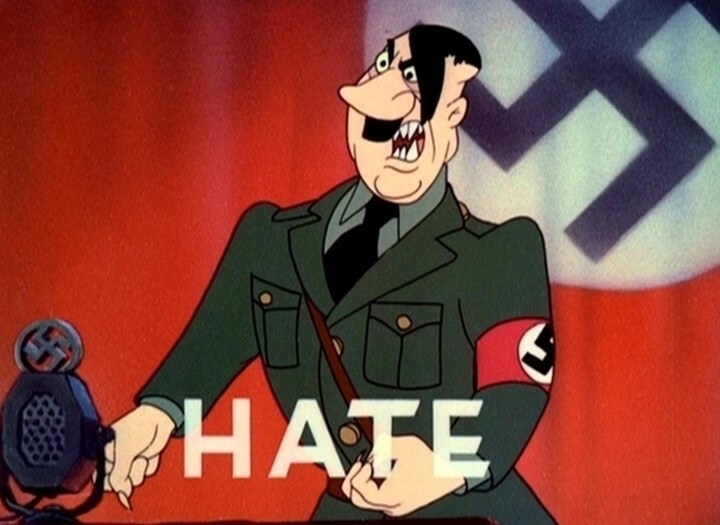 An animated Adolf Hitler stirring up hateful emotions. That message is, ultimately, identical to the message of Inside Out — minus the Hitler, of course. 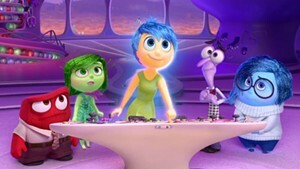 Inside Out’s ultimate point is that we need to strike a balance among all of our emotions, even the ones that can be difficult or troubling. Indeed, the film suggests, it’s the balance of emotions that makes us human. That same sentiment can be found in “Reason and Emotion,” which characterizes the all-emotion Hitler as a subhuman monster. Another parallel between the two films is one that I alluded to earlier. In its ready embrace of gender stereotypes, “Reason and Emotion” comes off as pretty retrograde. 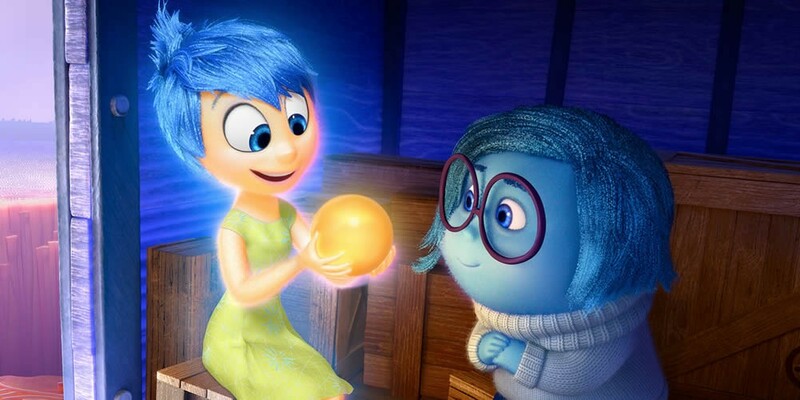 Yet that was exactly my response to the coda of Inside Out, in which we are shown, for the first and only time, the emotional homunculi that dwell inside the parents of the main character. I was pretty surprised to see Pixar embracing some pretty hoary gender stereotypes: The emotions in the father’s head are gruff and preoccupied with sports, while those in the mother’s head are sensible and preoccupied with child rearing. Even though they’ve freely admitted that “Reason and Emotion” was one of the inspirations for their recent blockbuster, I don’t imagine that Pete Docter or the rest of the Pixar brain trust intended to embrace this particular element from that short film. Perhaps they allowed their own faculties of Reason to be overrun by Emotion.